"This morning, at long last, the weather changed and turned milder - and likewise I have already had an opportunity for learning what a mistral is: I have been for several walks in the country round here but in this wind it is impossible ever to do anything. The sky is a hard blue with a great bright sun, which has melted almost the whole bulk of the snow, but the wind is cold and so dry that it gives you goose-flesh. But all the same I have seen lots of beautiful things - a ruined abbey on a hill covered with holly, pines and gray olives." 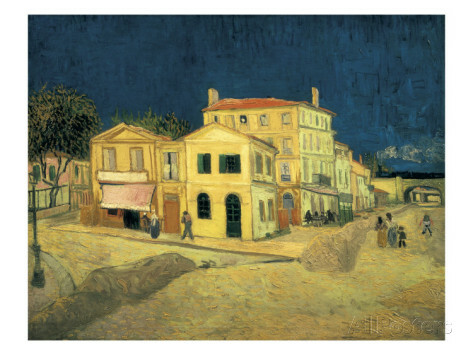 Vincent van Gogh paintings of Arles: Couple in the park, Arles, 1888; Path in the Park at Arles, 1888; Entrance to the Public Gardens in Arles, 1888; Garden in Bloom, Arles, 1888; Ladies of Arles (Memories of the Garden at Etten), 1888; Red Vineyards at Arles, 1888; The Dance Hall at Arles, 1888; The Caravans, Gypsy Encampment near Arles, 1888; The Langlois Bridge at Arles with Washer Women; The All-Night Cafe at Arles; Bedroom at Arles; Nightcafe Arles; van Gogh's Bedroom at Arles, 1889; Les Alyscamps a Arles; Harvest Arles 1888; Sunflowers Arles 1889; Cornfields Near Arles; View of Arles; Nap, Arles 1889-1890; The Drawbridge At Arles, 1888; La casa gialla - Arles, 1889; Der rote, Weingarten in Arles, (detail); View Of Arles With Irises. And, if you are looking for fine art, you may want to surf over to our fine art poster pages.